Hrishi K: Hello and welcome to another episode of NSE Presents: Invest – O- Cast (An exclusive investor podcast) Powered by MoneyControl. My name is Hrishi K I am your host on this podcast is all about getting your money to make better investments for you in the new financial year. We all have goals. And goals need money. The problem: We don’t know how much we need to invest to meet our goals smoothly. We try to save but often don’t do it. We end up making a mess of our short term and long term goals. The trick is to make your money work for you. Apart from just saving for a rainy day, we need to invest for our goals. Simply saving money doesn’t work. You need to get smart about money. As long as you remember money makes money, life is sorted. Investors expect their investments to dance to their goals but often that isn’t the case. Different kinds of investments carry different types of risks, and small fluctuations cause investors to make rash decisions. In today’s podcast we are going to talk about the importance of having long term investment goals as well as the importance of setting short term investments goals. A short-term investment is typically for a time-horizon of 1-3 years, and a long-term investment lasts for at least a decade. National Stock Exchange (NSE) with the help of Invest – O- Cast (An exclusive investor podcast) Powered by MoneyControl is committed to break the limitations of geographical boundaries and reach investors across the country. Today’s guest on our podcast will talk to us about different kinds of investments, the risks they carry, and do we plan our finances judiciously. Our guest today is Lovaii Navlakhi, the Managing Director and CEO for International Money Matters Private Limited. Lovaii was one of the first Certified Financial Planners in India, and the only Certified Financial Transitionist in the country. He’s been advising people for almost two decades now as regards their personal finances. It’s a great opportunity to pick his brain and that is exactly what we are going to do in the next 12 minutes today. Hrishi K: Welcome to the show Lovaii. Great to see you and let’s get right into it. When people come to you to help them with finances, are they aware of their end goals, or do they expect you Lovaii to set it for them? Mr. Lovaii Navlakhi (Managing Director and CEO for International Money Matters Private Limited):Hi, Hrishi that is good to be in this show. I think that everyone is really aware about what their dreams and aspirations are pretty much clear about that but I am not so sure that they are articulated it and when you ask them to quantify in terms of money which is what we as financial planners tend to do, people almost feel restricted, constructed, saying you know why you are asking me to quantify how much I need. But as you mentioned, money gets money, you know money they need to do that. So they do come to us with sometimes their dreams but not their quantifications and when we help them to put some sort of frame work and the fact that we have had experience with talking to other people and help them to set their goals and achieve them then they sort of try and relate to it and then you know get down to putting it. So I would think that to answer your question simply not necessarily everyone has got the goal listedin a way we would like them and I am sure everyone has dreams and aspirations. Hrishi K: Well said, now Goals change at every stage of our lives we all know that Lovaii. When we are just starting out in our careers, we have different goals compared to, let’s say, when we are starting a family. How do you define short-term and long-term goals for different stages in our lives? Can you actually break it down perhaps in three stages? Mr. Lovaii Navlakhi (Managing Director and CEO for International Money Matters Private Limited): Yeah, so the first thing that comes to mind in 3 stages, is you know when I need to travel to Mumbai or Delhi from Bangalore and I need to take a flight. The first thing is that I need to take an Uber to an Metro station, then I take a metro to the Airport, one fine day and then I take the flight, so the Uber drive is a short term sort of objective, Metro is short of medium term and the flight of course is the long term goal and similar to that I think people in their lives perhaps have issue when they are planning saying when they are single, their sort of objectives are having a great time on weekend or may be little bit of amount to be put aside funding their own marriage but after marriage it then gets down to planning for the kids etc. their education and then the final thing would be you have to think of the retirement. So from that point of view these could be different types of goals, these are short, medium and long term. So while you are focusing on short or long I think there is somewhere a medium which fits into the bucket as well and those are the 3 different ways I would think of goals. Hrishi K: Sure, what expectations should investors have for their short-term investments? So let’s now focus on just short term investments and really what are the safest kinds of such investments? Mr. Lovaii Navlakhi (Managing Director and CEO for International Money Matters Private Limited):Yeah, so when you know you look at investing people have different objectives from their investments, if you ask anyone what do they require from investments they tend to say I want high returns, I want really zero risk and I want you know all the liquidity whenever I need the money I want it. So when you look at it from a short term point of view the biggest requirement is liquidity. I need that money to pay that EMI next quarter. I need this amount to pay my fees 4 months from now, so those are typically their requirements which come up in the short term and therefore the most important requirement is liquidity. The second most important requirement is safety that I want that money at that point in time. Now returns is probably a secondary requirement, it is not the main requirement. So just leaving it in the bank could be possibly one of the safest things to do. Just that the rate of return that I get on that post tax may not be very good, so an alternative could be liquid funds or money market funds, where my returns as compare to banks are better post tax. 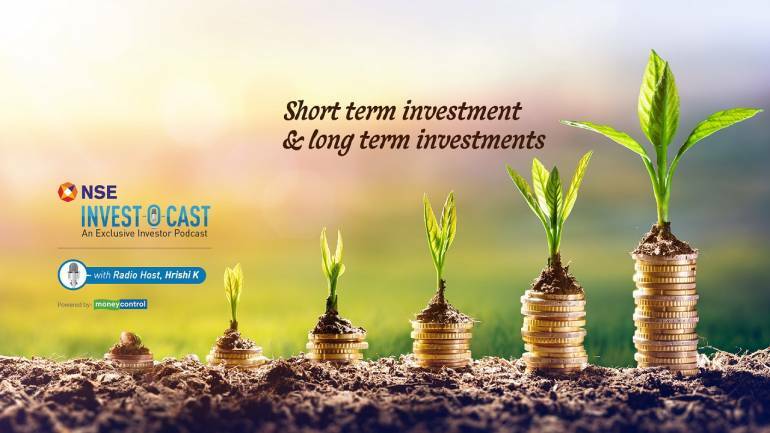 Hrishi K: You are listening to National Stock Exchange (NSE) presents Invest – O- Cast (An exclusive investor podcast) Powered by MoneyControl we’re committed to break the limitations of geographical boundaries and reach investors across the country. And today we are talking to Lovaii Navlakhi, Founder and CEO of International Money Matter Pvt Ltd. Lovaii now let’s now focus on the long term investments? Does it make more sense to put more of our long term investments in debt or would you say put them in equity? Mr. Lovaii Navlakhi (Managing Director and CEO for International Money Matters Private Limited):So I don’t have a straight forward answer to that question. So when I am looking at long term investments the most important thing that I need to look at is risk. So I want great returns but what’s the type of risk that I am comfortable in taking, so it is that taking that earlier example of taking that flight, I know I will get into the aircraft, the plane will take off, it will land but of course we all know what happens in between, there are pocket of turbulence, the seat belt sign comes on, sometimes you know the mask drop down automatically and then at that stage you, you know can’t really focus on trying to jump out of that air craft at that point in time. So depending on the amount of risk that you know you are willing to take and the amount of money that you are putting in for the end objective. You decide whether you know you are going to be fully in equity, fully in debt but we do know that you know if we are investing for long term 5-7 years point of view, you possibly won’t lose money in equity, so you could consider you know being in equity. Hrishi K: What are the risks we should be aware at both ends of spectrum. One is while making short term investments and the other while making long term investments? Mr. Lovaii Navlakhi (Managing Director and CEO for International Money Matters Private Limited):Great question, so what really one needs to do is to be aware about that first and foremost match your instruments or the product that you are investing it with the goal, so there are certain products like liquid funds or your bank balances and the bank deposit, which may be good from a short term going point of view but they are not the things which is going to give you the fuel to reach your destination where you want to go really really far, so matching that is number one. The other thing obviously you have to think of market risk, so there will be certain products which will go up and down like equities, as they are linked to the markets and your fixed income products there could be a default list so we have seen recently all bunch of companies which have had defaults. The other risk if we are sort of used to doing fixed deposits investing and thinking that I always get X rate of return or 7% on my fixed deposit would be a re-investment risk. So when the deposit matures I might not get the same rate because interest rates have fallen and finally I suppose the biggest risk that one has to be very careful about is inflation, so all your investments decisions should be taken keeping in mind what’s the rate of return post tax and does it beat inflation after that. Hrishi K: Now there are 2 things one is when you invest your money and the other is when you dilute your investments. There must be some common mistakes occurring again and again when you go to your clients and people come to you and say, when making or diluting investments I make some common mistakes. So what are these common mistakes and how can they be avoided Lovaii? Mr. Lovaii Navlakhi (Managing Director and CEO for International Money Matters Private Limited): So I think the common mistakes is one of course that you know you do not know enough about finance or you sort of rely on a friends or a relative and say if he made money by doing this or if he invested in this particular place, I also do the same thing,. Your sort of risk appetite, your goals, and your experiences may be quite different, so don’t just blindly follow that. The second of course is look at the most recent returns and follow and say that if I wanted to invest and last year was a great year and let me now put money because even now if I put money I will get the same sort of results, so I made 45% last year so let me invest today and next year I will make 45%. And the same thing happens while diluting Oh! I put this money last year down so now let me get out. So one must know that when you are investing what is the time duration of such an investment for it to really play out. So equities really play out over 5 year plus period, debt they plays out over 3-4 years of period so look at that. And finally I think the way to avoid this really is that to try and remove your emotions from decision making, so whether you are acting in fear or greed if you are doing it yourself, there is bound to be your emotion coming in which is why we think that biased may sound good idea to outsource it to a good financial advisor. Hrishi K: Well that’s all the time we have for questions with Lovaii Navlakhi. It’s been a great podcast. A lot of my doubts have been cleared and I going to approach my investments in a very different fashion. Ok its high utility. And I am sure people will agree. It’s now time for ‘Wisdom in the Bank’, the segment on this show that does a quick recap of all the points that our guest has spoken about. And Lovaii Navlakhi covered a lot. People are aware of their dreams but they are not able to articulate or quantify their dreams to reality. Go to a financial advisor who explains and helps you. Liken short term, long term, mid-term goals to travel. Short terms goals are like taking a cab to the metro station, mid-term goals is taking the metro itself, long term goals is like taking a flight out of the city. People should have different types of goals at different stages of their lives. Thereby the investment vehicles to fulfill those goals should also keep changing. Short term goals require a high liquidity and not so much focus on return. Only if you have high liquidity will you be able to pay your EMI or regular fees. Long term investments, you need to concentrate on the return. It depends on when you need the money and what the sum is. Also your risk tolerance. Matching investments and objectives is very very important. Think of your default risk, your investment risk, and your re-investment risk. Don’t be reactive and don’t react to the inflation and think of your goals. Allow your debt to play out over a 3 year period. Allow your equity to play out over a 5 year period. Lovaii it’s been a pleasure having you on the show today. We hope to catch-up soon. Cheers! Thank you. Mr. Lovaii Navlakhi (Managing Director and CEO for International Money Matters Private Limited): Cheers! Thank you. Hrishi K: Remember listeners, as there are going to be ups and downs with your investments and also with your goals. Don’t lose sight of the target and you’ll get home comfortably. We have an amazing line up of guests for the remaining podcasts and their pearls of wisdom are going to make us wealthier than what we are today. That’s a wrap on our show NSE presents Invest-o-cast! I am Hrishi K for the NSE Presents: Invest – O- Cast (An exclusive investor podcast) Powered by MoneyControl. To know more about our podcast, log on to moneycontrol.com and visit the podcast section. In case you would like us to address any of your investment queries on our show do write into us at: nseinvestocast@nw18.com, that’s nseinvestocast@nw18.com . You can also reach out to us on Twitter @moneycontrolcom or Facebook @moneycontrol.com, please remember to use #nseinvestocast. Next post: How to find the right credit card that fits your lifestyle?